It's almost needless to say that business pitches like "Get Rich Now!" or "Grow Your Business Revenue by 10x!" or "Earn $90,000 Working From Home!" should be avoided. It's not that these businesses don't want you to succeed, rather it's that their priority is to get you to buy their system or program, at any cost. Twenty years ago, I was browsing magazines at my local Borders bookstore. A forty-something-year-old man approached me and said, "I can tell, by the magazines you're looking at, that you're an interesting person." Flattery will get you everywhere. After a couple minutes of chit-chat he told me that he trusted me enough to give me a cassette tape with some business opportunities. It only cost me my phone number. I listened to his tape. It was a recording of a 15 minute group presentation about getting rich, living your dreams, having enough money, etc. As I listened, I kept wanting to know more. Specifically, how do I do it? How do I get rich? Then I realized what it was. When he inevitably called me, I asked, "How is this different than Amway?" "We are Amway," he exclaimed. Thanks, but no thanks. One of many problems with Amway is that they treat every person as if they can be turned into a hard-sell sales person. That's like assuming we can make every person a software engineer. To each their own. Engineers and sales people are wired differently. This past week, I attended a free presentation with headlines similar to those I mentioned above. I knew exactly what to expect, and reality was inline with my expectations. These pitches follow the tried and true "amway-ish" techniques. "Would you like to earn an extra $2,000/month?" Of course you would. Who wouldn't? 3. Offer a single solution: Buy my money making system. You'll see the same routine over and over again. These companies will push their benefits hard, with details, without explaining a single, actionable feature other than buying their system. The tripwire is something like, "I charge $500/hour, but I'll give you a free hour to see if you can be accepted into my sales program." Adding scarcity is another key selling point. Generally, the benefits of their system will be explained, in detail. "I used to do this, but now I do this." This is an excellent story telling technique I learned from Joyce Maynard. "I used to work hard for six months to earn $2,400. Now, I only need to work for six days to earn $24,000. And my program can show you how to do it." While the benefits are plentiful, the features are scarce. The "How is it done?" details are no where to be found during the initial pitch. And, when you hear it, it's almost always a let down. My guard was down when I was in Borders, flipping through magazines. And cheap sales talk is designed to catch the attention of the unguarded. And, as I mentioned, you'll hear little to no details on the features of the system. In other words, "What do I need to do to achieve success?" or "How does it work?" is missing. That requires signing up for the program. So, why do people continue to fall for it? PT Barnum is credited with answering that question. In the 1990s, I read Information Anxiety. It's written by Richard Saul Wurman, the creator of the TED talks and the Access travel guides. Wurman wrote about how to manage information. The anxiety he speaks of stems from the explosion of information; the fact that an issue of the New York Times contains more information than the average person in seventeenth-century England would have encountered in a lifetime. Wurman suggested ways of coping with the overload of information by visualizing the invisible, such as size or distance and compare them to tangible things. For example, an inch is the diameter of an American quarter coin, six inches is the length of a U.S. dollar bill, an acre is roughly the size of a football field, without the end zones. A common analogy I frequently make and forget (which is my primary purpose of this blog post) is explaining how far San Diego is from San Francisco. In raw distance terms, it's about 500 miles. That's the same as driving from Washington, D.C. to Kittery, Maine, which is at the southwest tip of that state. That's a long distance, but it pales in comparison to the 830 mile trek from the southeast tip of Texas (Brownsville), due north, to that state's most northeastern point in Follett. My Silas Wood 6th grade teacher, Ms. Cooke, speaking about South Huntington Schools Hall of Fame inductee and Bank of America executive, Kieth Cockrell. What's the secret to telling a great story? It depends on a lot of things. Mostly, though, it's important to know your audience. The topic of your story doesn't even have to be interesting, rather, how you tell a story is key. A little levity and drama is helpful, when appropriate. Great storytellers have a way to pull in their audience without shutting them out; and the latter part is key – think about great mysteries with surprise endings. A few years ago, I began writing fiction. I simply sat down at my computer and wrote a few short stories. And I made some classic mistakes, such as beginning a story with weather and writing the cliche story about a divorced woman and a sick dog. I had no idea if my storytelling was good, so I went to a professional, Joyce Maynard. Joyce's biography always begins with the fact that she wrote her first book while living with the author of The Catcher in the Rye, J.D. Salinger. What adds to the allure of this tale is that, at the time, Joyce was 19 years old and Salinger was 53. But it was truly the high quality of her writing that got the attention of Salinger when, at 18, her article, "An 18-Year-Old Looks Back On Life" was the cover story of The New York Times Magazine in 1972. A key thing I learned from Joyce is that the story behind the story can be more interesting than the story, itself, since it's more exciting to show people what's going on behind the curtain. Even more important is the storytelling technique of summarization that I learned from my sixth grade teacher, Ms. Cooke. Last weekend, I had a chance to spend a couple days with Ms. Cooke – something I hadn't done for five years – and it was highly enthralling. I, along with several other 6th grade classmates, still connect with Ms. Cooke because she had (and still has) a strong presence in our lives. She cared about us as students and she was a great storyteller. She's a smart, independent person who neither tolerates fools nor stupidity. As a teacher, she wanted to teach her students not only book smarts, but also key lessons in life. The quintessential "teach a person to fish" by showing us critical thinking skills. After more than 30 years in the classroom she retired and opened The Cooke's In restaurant for more than a dozen years. 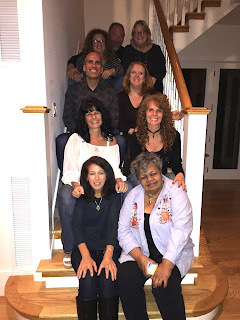 Shortly after retiring from her restaurant, in 2009, I spent a couple days at her house scanning school photos covering three decades, followed by a mini 6th grade reunion where we got to hear more of her stories. 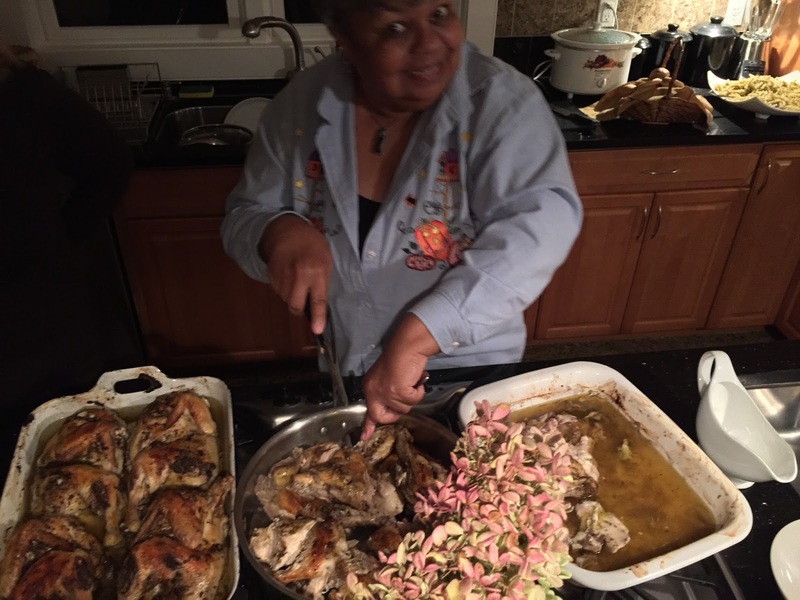 Ms. Cooke preparing her spectacular jerk chicken. Fast forward to two weeks ago, the night before my 30th high school reunion, when about half a dozen of us from my 6th grade class descended on a classmate's house in Amagansett, NY, in the Hamptons, for a couple days of reminiscing. 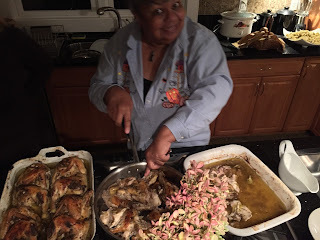 Of course, Ms. Cooke joined us and prepared her spectacular jerk chicken. While listening to her speak, I learned another key storytelling secret: keep your story short and to the point. As we hung out in the kitchen and spoke about how good her food was Ms. Cooke said, "You know that the secret is to running a restaurant? Expediting." Do you see what she did there? She summarized her entire story – a story she had yet to tell – in a single word that drew us all in. "What do you mean?" we asked. She told us that running a restaurant is about coming up with a recipe and being able to make it the exact same way, every time, and to do that quickly. She told us the obvious, but it carries more weight when spoken by the voice of experience. She told us just enough to pull in our attention and then she answered our question without waste of time or words. We speak about "active writing," but active talking is equally important since it's a key essence of storytelling, regardless if it's fact, fiction or marketing.